As I waited to climb up the fabric towards the ceiling, I took a look around me… people doing handstands, swinging from trapezes, and stretching in silky hammocks. What a world of people exploring their potential, what a crazy place…. Last night I went to Cirque School. I’d purchased a Living Social voucher for 5 classes, since I have a growing fascination (hey, thank you spellcheck! Missed that ‘s’…) with aerial silks. I attended the aerial fitness and conditioning class, since you need approval to move on to the aerial tricks class. All I really wanted to do was get tangled up in fabric, 10 feet in the air. But we rotated between the mat, trapeze and silks too frequently to do much of anything up there. At first I was frustrated and disappointed. But soon I was too weak to even get halfway up the silks anyway. I knew it wasn’t a good idea to take Krav Maga and silks class in the same day. Not that I need to prove these thoughts wrong just by looking for other people who have defied them, but a quick Google search shows me how wrong some of these discouraging thoughts can be. 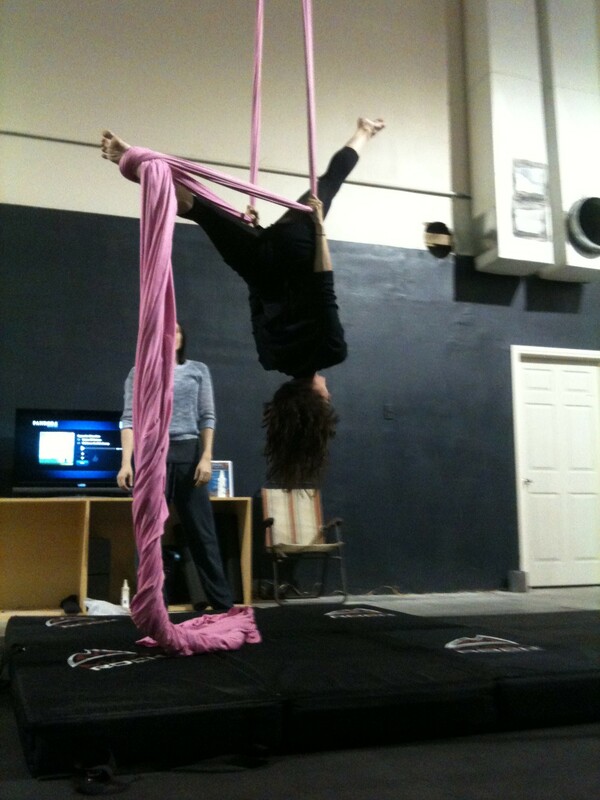 Jessica in Washington DC took her first class at age 32 and is now an aerialist. In fact, one woman, Kathie Hightower started learning at age 57. But really, the lesson I’ve been learning, through all the classes I’m taking and all the adventures I go on is to never say I can’t do something until I’ve actually made an effort to do it. Not just one class while I’m still out of shape. Not just one trip somewhere that doesn’t go right. Nothing. And I know when I’ve given 100% and when I haven’t. This morning I woke up to a new blog post by Niel Doherty on limiting beliefs and reference experiences, so I thought I’d reference it here. Niel has a great blog chronicling his adventures across the globe without flying. I may not personally agree with his “pick up dealio” (you can judge a person’s interest in you without bringing her, or any other problems, home for the night. You don’t know these people… that’s just…. ew) but hey, it’s nice to see a guy really learning from experiences! I feel like a lot of people don’t push their boundaries enough to grow, or they experience things without really learning anything about themselves through it. Great post and thanks for the shout out! Thanks for the great post and the linkage. I love that you can disagree with the pickup stuff I’m into without condemning me for it. I wish more people could do that. I’ve had much growth in my time as a human being… lol More to come. Keep up with the great blog! 😀 Maybe we’ll meet up someday/somewhere.